Hurricane Season in Barbados. Are you ready for it? Click on Picture for Today's Weather Forecast.Have a super day come rain or shine. 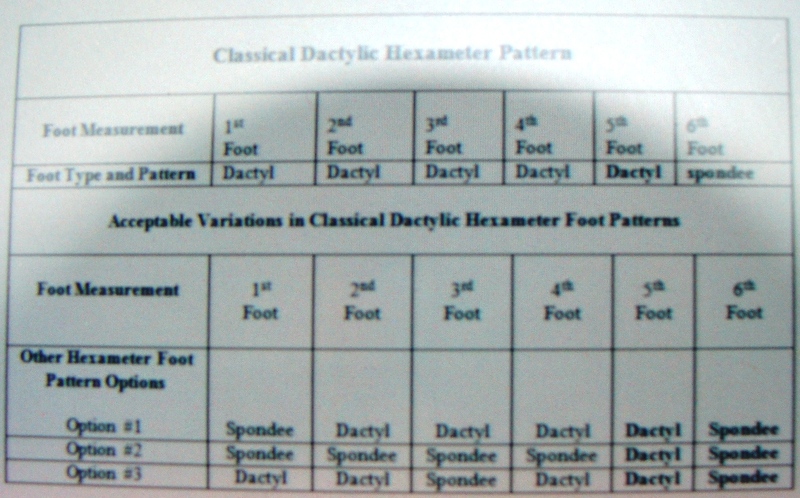 Dactyl is a foot in metered poetry having the first syllable long followed by two short syllables in quantitative meter shown by the following symbols ̵ ᵕ ᵕ and in qualitative meter the dactyl has a pattern where the first syllable is stressed followed by two unstressed syllables shown by this pattern ̷ ᵕ ᵕ so the word “poetry” ( p̅o ět řy ) is itself a dactyl and measures one foot. The dactyl is what defines the Hexameter. The Hexameter consists of six feet. It is also called the “Dactylic Hexameter” and the “Heroic Hexameter”. It has traditionally been associated with the Quantitative meter of classical epic poetry in both Greek and Latin. The poets of that era considered the Hexameter to be the grand style of classical poetry of which Homer’s Iliad and Odyssey and Virgil’s Aeneid are the premier examples. The dactyl ( ̷ ᵕ ᵕ ) a long syllable and two short syllables is what drives the Hexameter foot but it allows for the inclusion of two long syllables ( ̷ ̷ ) called a spondee. A short syllable ( ᵕ ) is a syllable with a short vowel and one consonant at the end (example: ăt but it is long in ātlas). A long syllable ( ̷ ) is a syllable that either has a long vowel, two or more consonants at the end; a long consonant or both (example: latch key). Space between words doesn’t matter. Specifically though, the first four feet can be dactyls or spondees, more or less freely. The fifth foot must be a dactyl. The sixth foot is always a spondee, though it may be an anceps syllable. Homer’s hexameters contain a far higher proportion of dactyls than later hexameter poetry. Homer used dialectal form that is, altering the forms of words so that words fitted the hexameter. Below is an excerpt from Henry Wadsworth Longfellow's poem "Evangeline" Preface: A Tale of Acadie shows the classical Dactylic Hexameter foot patterns. 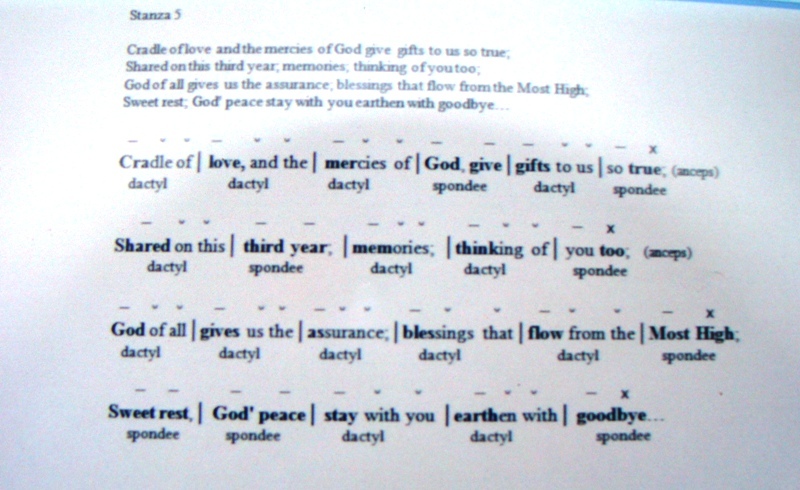 The dactyl appears in the compulsory fifth foot and the spondee in the compulsory sixth foot, this final metron is represented by ( ̵ x ) but in any given Dactylic Hexameter verse it is not uncommon to find either a trochee ( ̵ ᵕ ) or a spondee ( ̵ ̵ ) but what happens when the Dactylic Hexameter has a trochee in the last foot when the rules of the Dactylic Hexameter insist that the anceps in the last foot must be a spondee; poetic license allows for the anceps x to be changed into a long syllable through the process known as poetic license, thus during the scansion of the poem the trochee becomes a spondee automatically. The anceps is a “free syllable” or “variable syllable” in a verse of poetry. The syllable may be either long or short or "irrational" depending on the meter being discussed. In Quantitative meter the symbol “x” is used when anceps occur. Hot air blowing in! Spider in bedroom, crawling in Jane's space. The five verses from“Aeneid” by the Roman poet Virgil show a full scansion. Notice that in the scansion of the Dactylic Hexameter poem above, three vertical symbols (│ ⁞ ║) stand serving a very specific function in the scansion process. Scansion is the analysis of metrical patterns seen in verses of a poem written in closed form. Closed form or metered poetry is characterized by regular and consistency in such elements as rhyme, verse length, and metrical pattern. This symbol │is called the Diaeresis. The diaeresis marks the boundary between the end of a foot and the beginning of the next foot. The diaeresis never occurs within a foot and does not mark any discernible pause in the sense of the poem. This symbol║ the “double pipe” is called the Caesura. Typically the caesura is significant when it occurs near the middle of the verse and correlates with a break of sense in the verse, such as a punctuation mark. 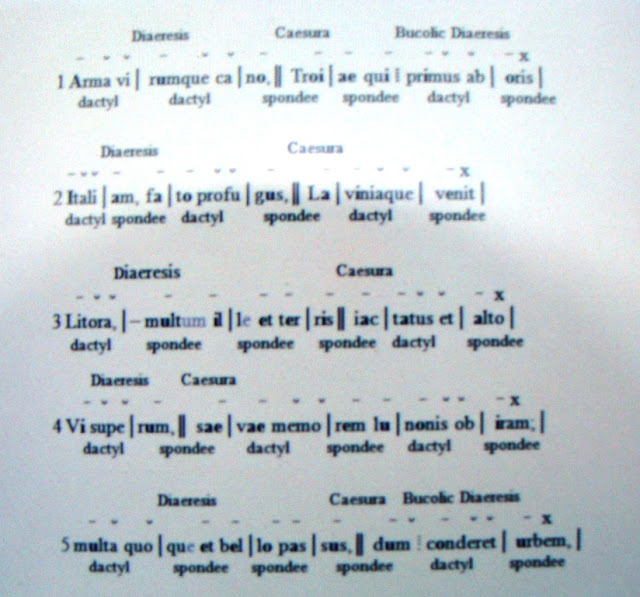 The caesura divides the verse and allows the poet to vary the basic metrical pattern being worked on. There are two types of caesura: masculine and feminine. A masculine caesura is a pause that follows a stress syllable; a feminine caesura follows an unstressed syllable. Another characteristic of the caesura is the position it holds in the verse. A pause close to the beginning of a verse is called an initial caesura, at the middle of the verse it’s called a medial caesura, and near the end of the verse it's called a terminal caesura. Caesurae are popular in Greek and Latin versification, especially in heroic verse form, the Dactylic Hexameter. Versification is the process of turning prose into verse using versifier tools such as content, form, poetic diction, measurement, sound effects and elements of poetry. In theory a caesura may occur in any of the six feet, and in fact most verses have two or more caesurae. The principal caesura marks the most obvious pause in the sense, and is usually in the third foot (although it often appears in the second and fourth feet as well). This symbol ⁞ is called the Bucolic Diaeresis. The bucolic diaeresis is a common feature in the scansion of dactylic hexameter where it is placed between the fourth and fifth feet of a verse and must end with the rhythm of dum-di-di dum-dum. This word, “bucolic” comes from the Greek word boukolos, “herdsman” because dactylic poetry of the herdsmen was notorious for “shave and a haircut” verse ending. The dactyl ( ̵ ᵕ ᵕ ) is the metrical foot of Greek elegiac poetry. This verse form became a common poetic vehicle for conveying any strong emotion. 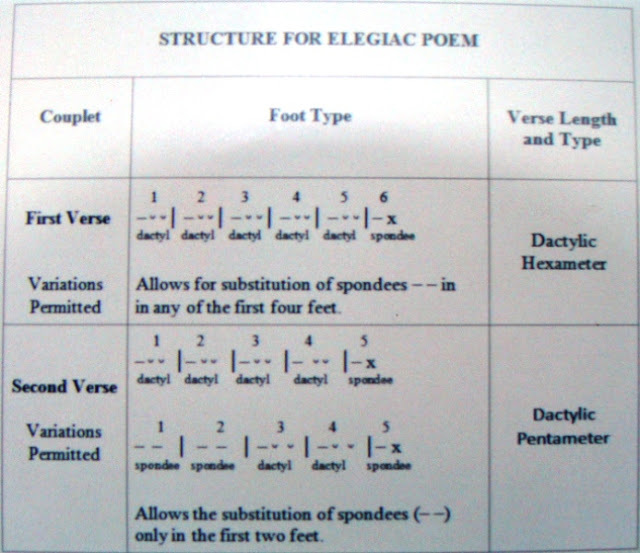 A typical verse structure of an elegiac couplet is shown in the chart below. The Roman poet Ennius introduced the Elegiac Couplet to Latin poetry for themes less lofty than that of epic, for which dactylic hexameter was suited. An Elegiac Couplet is a pair of sequential verses in poetry in which the first verse is written in dactylic hexameter and the second verse in dactylic pentameter. Ovid, the ancient Roman poet is considered the master of the elegiac couplet and in his “Amores” provides striking examples of this. The first two verses of his “Amores” shown below are scanned to show how he structured his elegiac couplets without end rhymes. End rhymes are never a common feature in Roman elegiac couplets. "Elegy for Angela Barnes, RN” is an elegiac couplet. 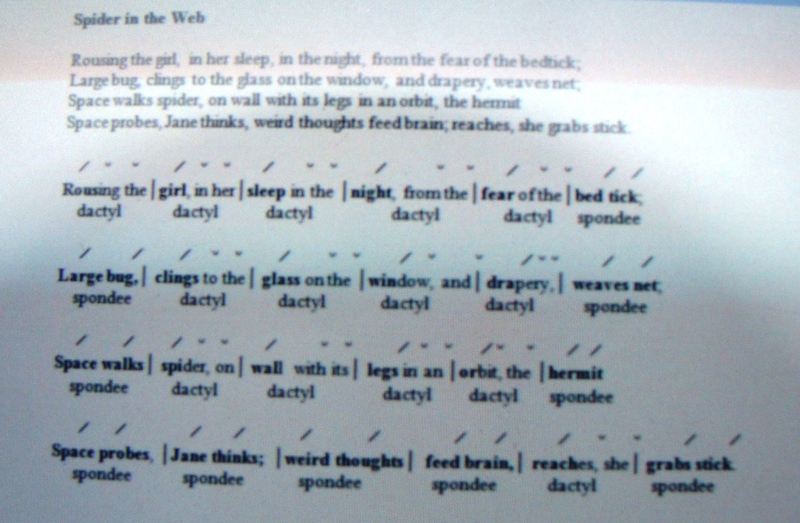 Stanza 5 of the poem is scanned using quantitative meter symbols as an example to show the verses structured along the pattern of the classical elegiac couplets. In quantitative meter the symbol for the short syllable is the ᵕ and this symbol ̵ is used for the long syllable. The symbols used when scanning verses in qualitative meter show unstressed syllable as this ᵕ and the ̷ for stressed syllable. This is okay because the English unstressed syllable ᵕ is equivalent to the classical short syllable ᵕ and the English stressed syllable ̷ is equivalent to ̵ the symbol used for the classical long syllable. 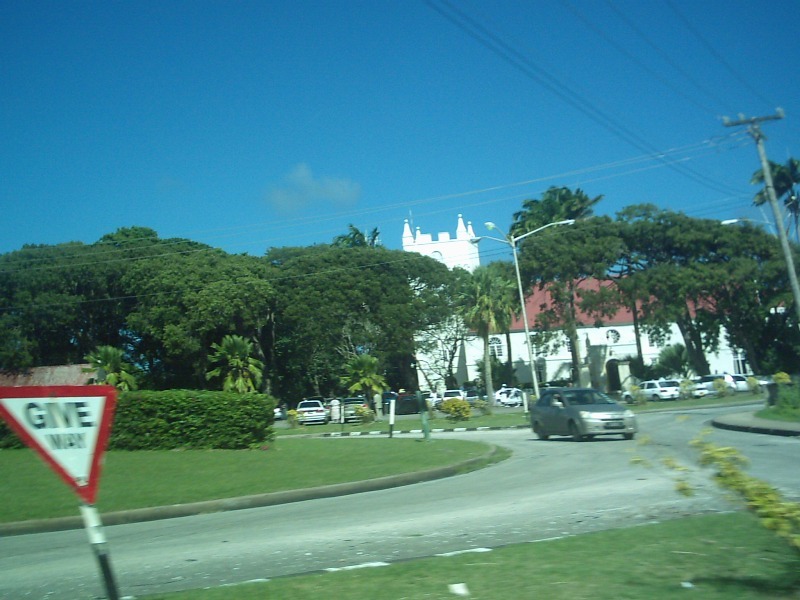 Is Barbados the Hurricane's sweetheart? My thoughts and prayers are with the people of Haiti. A poem is made up of the following parts; speaker, audience, subject, tone, theme, diction, imagery, figures of speech, sound and rhythm. Comments on "Errol Walton Barrow, the Statesman"
Comments on poem, "Constructivism in the Classroom"
Icelandic Souvenir purchased by my daughter during her April 2009 business trip to Iceland. She purchased the souvenir rock from Geysir Store (steinadalur@simnet.is) These words are written on the back of the frame: "Objects of art have their own creators and designers, in this case the artist and the designer is Icelandic nature. The colours and the form of this particular stone show us how fire, ice, water and winds have in unison molded this masterpiece designed by nature. 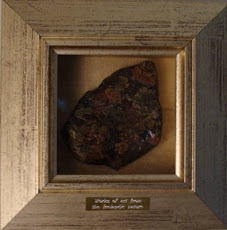 The stone has been fitted with a frame that emphasizes its unique natural qualities". So I proudly display this gift from my daughter's recent trip to Iceland for these reasons: its beauty and the wisdom embedded in it by Mother Nature.